Alia Bhatt attended GQ Style Awards last night in Mumbai. She was dressed in a pink chiffon gown by Nedret Taciroglu. She completed her look with matching ankle strap sandals. Alia won the Most Stylish Woman award. The Udta Punjab duo - Shahid Kapoor and Alia Bhatt - meet up in style. 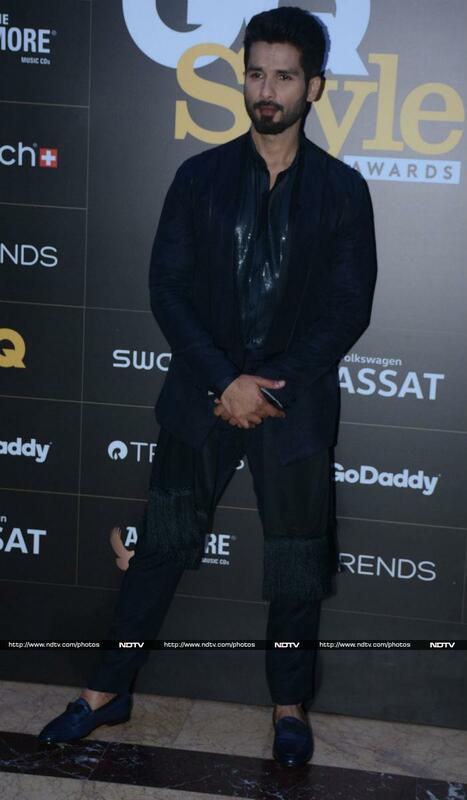 Shahid Kapoor walked away with the Most Stylish Man award. Akshay Kumar looked dapper in a khaki plaid pants and black shirt. Huma Qureshi looked pretty in black and mauve creation by designer Gaurav Gupta. Actress Nushrat Bharucha looked elegant in that black floral printed gown. Surveen Chawla wore a strapless sequin gown from Garimon Roferos Couture. Isabel Kaif picked a shimmering blue off shoulder gown for the night. Kriti Sanon's sister Nupur was also there. Niddhi Agerwal photographed in a stunning mauve coloured dress. Jim Sarbh and Rahul Khanna posed for photographers. Nora Fatehi picked an all-white ensemble for the night. Actress Isha Talwar was dressed in a mustard peplum top and matching flared pant - a Label D creation. Cricketer Rohit Sharma and wife Ritika Sajdeh looked pretty together. Actor Purab Kohli was dressed in an all blue ensemble. Akshay Oberoi picked a white and blue suit for the night. Kai Po Che actor Amit Sadh was dressed in a mustard coloured overall, which he teamed with unzipped black jacket. Actor Arunoday Singh arrived with wife Lee Elton at the GQ Style Awards. Actor Mohit Marwah picked a white shirt and black denims for the night. Rahul Bose photographed at the event. Arjan Bajwa posed for photographers. Designer Kunal Rawal was also photographed at the event. Veteran actor Kabir Bedi was also there.